We know saving money is always first on your shopping list. We make it easy to save with store brands that are as good as national brands, and unique products developed in partnership with local producers. 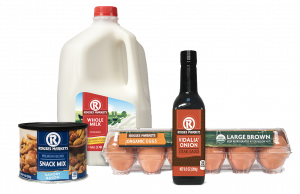 Our own Rouses Markets private label offers great value on everyday essentials, from milk, bread, eggs and water to gourmet and specialty items like extra virgin olive oil and local seasonings and sauces. You’ll find hundreds of our Rouses Markets products throughout the store. Each food item has been personally tasted by the Rouse Family, and each product is guaranteed to deliver the best quality at the best price.